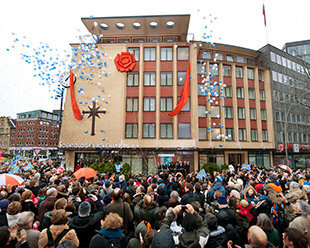 The Church of Scientology Hamburg was newly dedicated on January 21, 2012, in ceremonies attended by 1,500 Scientologists, dignitaries and guests. The Church stands at Domstrasse 9 in the center of Hamburg’s historic district. The newly renovated and expanded facility meets the needs of Hamburg’s growing Scientology congregation and serves as a center for people of all faiths to unite for community and social betterment. On January 21, 2012, the Church of Scientology Hamburg celebrated the opening of their fully transformed home at Domstrasse 9 in Altstadt, the center of Hamburg’s historic district. 1,500 Scientologists, dignitaries and guests gathered in the center of Hamburg’s historic district to dedicate the city’s Church of Scientology on January 21, 2012. Located at Domstrasse 9, it has been home to the Church for more than a decade. The ceremony marked the culmination of the full renovation and transformation of the seven-story facility into an Ideal Church of Scientology Organization (Ideal Org). The Church of Scientology Hamburg stands at the historic birthplace of Hamburg in a landmark square of renowned churches at the spiritual heart of the old city. The seven-story building is newly transformed into an Ideal Org to provide for all Scientology services and further serve as a meeting ground for people of all faiths. The Church of Scientology Hamburg’s reception welcomes all who enter. Here, visitors will find an array of introductory books and a Public Information Center, presenting the fundamental beliefs and practices of Dianetics and Scientology. Adjoining reception is the Testing Center to assist individuals in gaining an understanding of their personal capabilities and directing their path toward spiritual awareness. Testing is among the many Introductory Scientology Services offered by the Church. The new Church of Scientology Hamburg Public Information Center, containing an array of multimedia displays in answer to the question, “What is Scientology?” More than 500 informational and documentary films present the beliefs and practices of the Scientology religion, as well as the life and legacy of Scientology Founder L. Ron Hubbard. The Public Information Center also provides a complete overview of the many Church-sponsored humanitarian programs including: a worldwide human rights initiative; an equally far-ranging drug education and prevention campaign; a global network of literacy and learning centers; and the Scientology Volunteer Minister program, now comprising the largest independent relief force on Earth. The Hamburg Scientology Public Information Center adjoins the Church’s café, open to both visitors and those attending scheduled activities. Introductory Services, including the Dianetics and Scientology Personal Efficiency Seminars, provide fundamental Scientology principles for newcomers. The Church’s bookstore makes available L. Ron Hubbard’s works on Dianetics and Scientology. Mr. Hubbard’s full legacy comprises tens of millions of published words and recorded lectures. These religious works are available in 50 languages. All congregational gatherings (including Weddings, Naming Ceremonies and Sunday Services) convene in the new Church of Scientology Hamburg Chapel. The Chapel further serves as a venue for public lectures, workshops and community-wide events. On January 21, 2012, the Church of Scientology of Hamburg newly opened its doors to the city in a dedication ceremony attended by 1,500 Scientologists, guests and dignitaries. The grand opening marked the culmination of a transformation of the seven-story Church into an Ideal Church of Scientology (Ideal Org) to better meet the needs of Hamburg’s growing Scientology congregation and the community at large. In full representation of that pledge—working together in a cooperative effort to help one and all—among those on hand to inaugurate the new Church were some of Hamburg’s foremost civic and religious leaders. They included a long outspoken human rights advocate, the founder of a leading youth drug addiction and prevention organization, a religious rights leader from the Greek Orthodox community and an advisor to Germany’s forthcoming Memorial and Documentation Center on National Socialism. A prominent feature of the new Hamburg Ideal Org is a comprehensive Public Information Center, enabling all visitors to answer the pivotal question, “What is Scientology?” Occupying the entirety of the ground floor, it contains a gallery of multimedia displays presenting the beliefs and practices of the Scientology religion, as well as the life and legacy of Scientology Founder L. Ron Hubbard. The Information Center also provides a complete overview of the many Church-sponsored humanitarian initiatives, including a worldwide human rights initiative; an equally far-ranging drug education, prevention and rehabilitation program; a global network of literacy and learning centers; and the Scientology Volunteer Minister program, now comprising the largest independent relief force on Earth. The displays offer some 500 informational and documentary films at the touch of a button. Open morning to night, the Information Center welcomes visitors to tour at their leisure and return as often as they wish. In combination with its adjoining café, the Information Center is also configured to accommodate hundreds at a time for weekly Open Houses. The Church was further planned to serve as a gathering hub for the entire community. The Chapel, home to all Scientology congregational services and ceremonies, can also be configured as a venue for events and other assemblies to coordinate humanitarian initiatives for the benefit of Hamburg and all her citizens. The venue is fully equipped with state-of-the-art video and audio for special film presentations and seminars. The Chapel further includes facilities to host receptions and banquets. The new Hamburg Ideal Org also now includes expansive facilities to provide Introductory Services for those new to the religion, including regularly scheduled Dianetics and Scientology Personal Efficiency Seminars and an array of Life Improvement Courses. The Church of Scientology of Hamburg is the newest of dozens of Ideal Orgs opened in the past five years. Ideal Orgs realize the fulfillment of Founder L. Ron Hubbard’s vision for the religion. They not only provide the ideal facilities to service Scientologists on their ascent to greater states of spiritual freedom, but they are also designed to serve as a home for the entire community and a meeting ground of cooperative effort to uplift citizens of all denominations. The Church of Scientology Hamburg is the first Ideal Org to open in 2012, joining a parade of Ideal Orgs already opened in cultural epicenters across Europe, including: Berlin, Germany; Moscow, Russia; Brussels, Belgium; London, England; Madrid, Spain and Rome, Italy. Other new Churches opened in recent years include Washington, D.C.; New York, New York; Los Angeles, California; Pasadena, California; Inglewood, California; Seattle, Washington; Tampa, Florida; Minneapolis-St. Paul, Minnesota; as well as Québec City, Canada; Mexico City, Mexico and Melbourne, Australia. More than 15 new Ideal Orgs are scheduled for grand opening in 2012. The Scientology religion was founded by L. Ron Hubbard. The first Church of Scientology was formed in Los Angeles in 1954 and the religion has now expanded to more than 10,000 Churches, Missions and affiliated groups, with millions of members in 167 countries.